No words needed! Cheryl Cole officially announced her pregnancy in a photo shoot for L’Oreal and The Prince’s Trust, which was published by The Daily Mirror on Thursday, February 23. Find out more in the video above, and detailed below! The Twitter account for the British publication released the cover featuring the British pop singer and TV personality, 33, cradling her growing baby bump on Wednesday. “Tomorrow’s Daily Mirror front page,” the caption read. In the pic, Cole wears a long-sleeve black dress and keeps her long brunette tresses down. 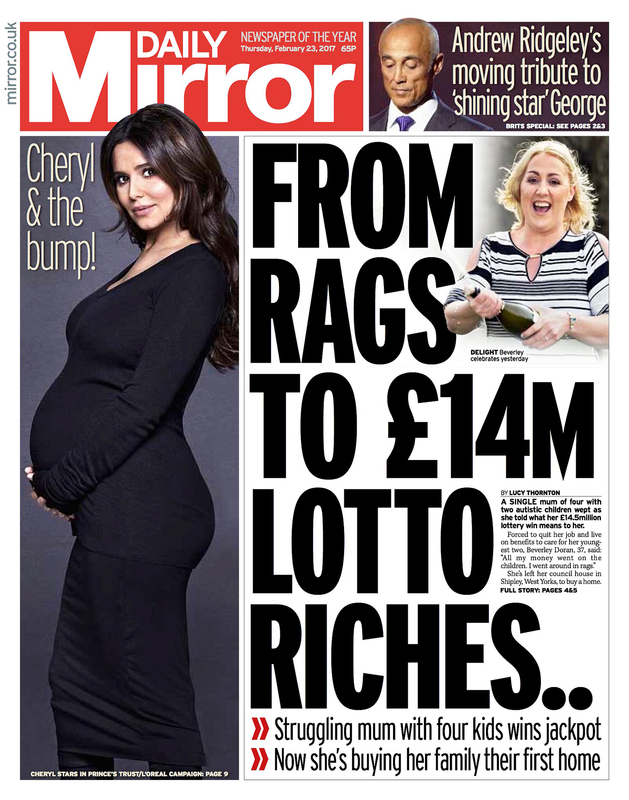 “Cheryl & the bump!” the headline says. As previously reported, Cole, who is far along in her pregnancy, is expecting a baby with former One Direction singer Liam Payne. She debuted her bump with Payne, 23, when they attended the St. James Christmas Carol Concert in London on November 29. This will be the first child for both. Cole (formerly of Girls Aloud) was previously married to Ashley Cole from 2006 to 2010 and ended her two-year marriage to French restaurateur Jean-Bernard Fernandez-Versini last year.